As a part of our ongoing training and development, all AltusQ coaches and staff commit to ongoing training and development. We run two formal national training conferences per year which require compulsory attendance by all at AltusQ. These are conducted at different locations across Australia or New Zealand. As part of our belief in giving back to society and our environment, each conference has a ‘built in’ component of what we term a “Love Project” whereby we take the opportunity to work as one team to give of our services or skills to a local community need or cause, or to support the growth of local businesses by using their services, inviting their owners to attend our training at no charge, etc. Over the years we have assisted numerous businesses, NGOs, charities and community groups in the communities where we run our conferences. In addition, we encourage our coaches to contribute of their skills to their local communities – to assist their local areas in building business strategy, leadership capability, etc. Cabarita Beach Community Dune Care – Coastal dune rehabilitation & conservation program: Weeding out non-native flora and replanting native vegetation. 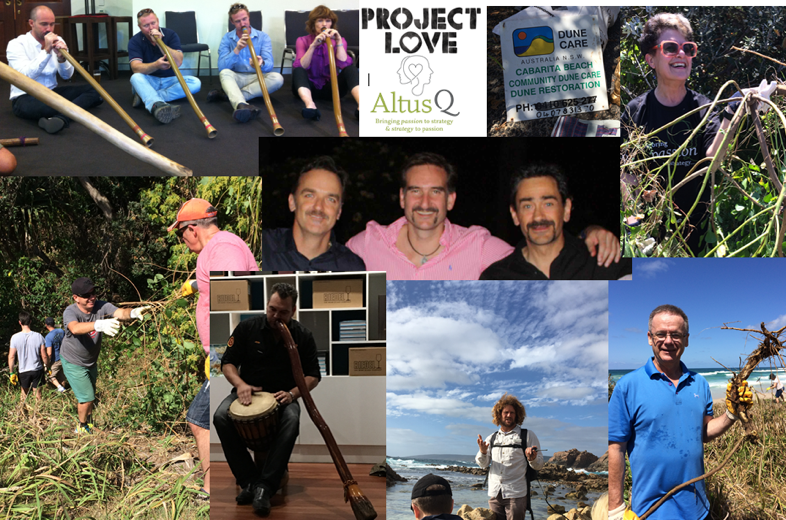 Working with local indigenous peoples to bring their culture and values to awareness in our team and clients. Wingate Avenue Community Centre – Team development days, management team training etc. Stretch-A-Family – Business coaching, Leadership Workshops, Board strategy alignment – NFP pricing.